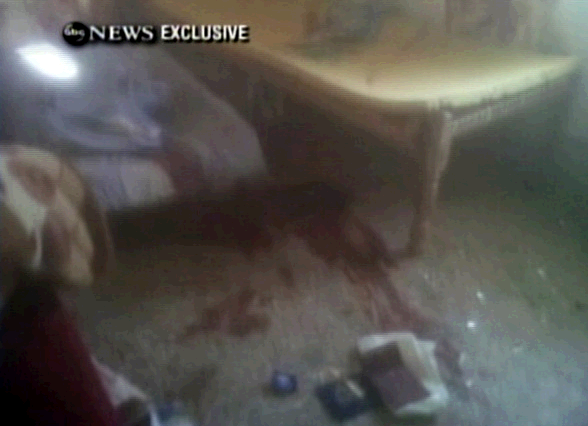 Graphic Image Of Osama Bin Laden's Room - Is This Where He Was Killed? Graphic Image Of Osama Bin Laden’s Room – Is This Where He Was Killed? The image above is supposedly a leaked image of the room where Osama Bin Laden lived when Navy Seals stormed his compound and ultimately shot him death. The Navy Seals elite Seal Team 6, is reportedly credited with taking out Bin Laden. However, because of the secrecy of their mission, and for the safety of the team members’ themselves, the Navy has yet to recognize the Seals were in fact in involved in the mission. In fact, as a former Team Leader in the 1st Ranger Battalion, I can assure you we will never “officially” know exactly who was involved in the operation, and what the details were. Was Osama killed on the 1st May 2011 by US Forces? Did he die of natural causes soon after 9/11 and did the US Gov keep his body until now? Is that really Osama or was it a random person? Was Osama really behind the 9/11 attacks or was the terrorist threat made up as an excuse to attack the Middle East? Seriously, how many typos can you make in one short article? Was this a 5th grade report of the news to his classmates? I hope the person writing doesn’t write for living.